Have you ever imagined what life as a virus might be like ? Always struggling for survival and searching for healthy cells to infect, in order to replicate yourself, become stronger and ultimately dominate an organism. I don't know if I could handle that much anxiety, if you ask me. "Virulence" is a card game designed by John Coveyou that tries to put you in the shoes of malicious viruses, trying to infect host cells and replicate their viral components. 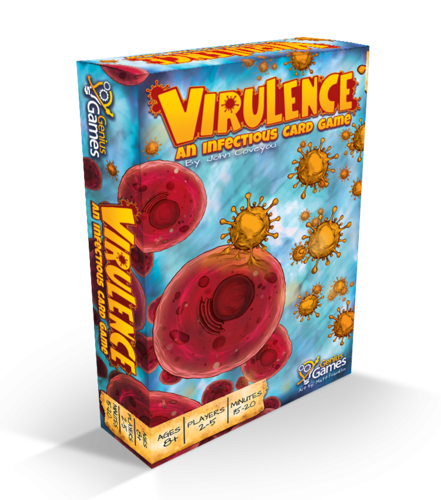 Virulence can be played by 2 to 5 players, with the 2-player game being a variant and it lasts about 15-20 minutes. Its only components are cards, plus 6 six-sided dice. The goal of the game is to score as many points possible by replicating the viral components of viruses namely: Icosahedral and Helical structures, Spherical Envelopes and Genomes. Each player starts out with the same Starting Virus cards, each with virulence 1 - 6 and one Reassortment card. There are 4 bonus cards that give extra points to the player that completes first a set of Helical or Icosahedral structures. During game setup these are shuffled and one is randomly removed. The rest are placed near the playing area face down and the top card is flipped face up. A number of cards are revealed from the top of the Viral Component deck, equal to the number of players. Each player chooses secretly a virus card, then all players simultaneously flip these cards to reveal their virulence. Icosahedral. A total of four cards is required to complete a set. Points are awarded even if you don’t complete a set. The more cards the higher points are awarded. Helical. A total of six is required to complete a set. Points are awarded even if you don’t complete a set. The more cards the higher points are awarded. Spherical Envelope. The player who, at the end of the game has the more cards, receives 12 points, the second best player receives 6 points and the last -6 points. Genome. These cards are worth a number of points written on them. Vaccine. These are worth negative points written on the cards. Wild cards: Icosahedral / Helical. Can be added to a set acting as either of the two. Mutated Virus Cards. These are extra virus cards with values 1,7,8,9 that can be added to the hand of players replacing an existing virus card. Increased Virulence. These cards give a bonus to the dice rolled when two or more players choose the same virus card. When all virus cards have been played except the Reassortment card, they are returned to the player’s hand on the next round. The Reassortment card can be used to take back all virus cards from the player's discard pile at any given time by sacrificing the round (You will not pick a Viral Component card that round). The game continues until there are not enough Viral Component cards to be flipped face up from the Viral Component deck. Then players calculate their scores and the player with the most points wins! With the quantity of card games in the market the last few years, making a game that is original and truly interesting is not an easy task at all. Virulence has very simple gameplay with a few but important tweaks that really make a difference. The blind bidding mechanism is always interesting and fun and creates unpredictable situations. Players must manage their hands of virus cards in a smart way, being careful not to waste high virulence virus cards for not very important Viral Component cards. Of course, the importance of cards is relative and depends on what cards each player focuses on collecting. An aspect of the game I really liked is the deck building mechanic and the way it is being implemented in the game. You can't directly choose the cards to add to your virus card deck but instead you must bid for them. Moreover you can't directly choose the cards that will be replaced by the mutated virus cards because you can only replace cards that reside on your personal discard pile. These facts add to the strategic depth of the game, forcing players to make plans and spend more thought to their bets and choices of cards. The inclusion of mutated virus cards with value 1 to the deck of cards is also a very smart design touch to the game, as this is a card that will weaken the virus card deck of the player that will be forced to choose it if he is the last one to make a pick. Luck plays its role in the game, as virus card ties, where the dice are used, are pretty common. Even so, the game still gives you the opportunity to improve your chances of winning ties, through the Increased Virulence cards that add a bonus to each dice roll and also score some points at the end of the game. This way the element of luck becomes more controlled and less frustrating to players. All the above aspects of the game, give a sense of control over your fate as a virus which really felt great and is something I always look for in a game. Moreover it is a rare case that such a simple game achieves that, which makes the designer's work even more important. Virulence can be played by two to five players, with the 2-player game being really a variant. Gameplay is equally good with three to five players, with the 2-player variant being well-thought, still a little less interesting than a game with more players. Players take on the role of viruses competing to invade a host cell. Virulence represents the strength of a virus. The stronger the virus (the higher the virulence) the sooner it gets to replicate its Viral Components. This is represented in the game by the player selecting from the available Viral Component cards. Viral component cards represent the real most important parts of a virus. Icosaedral and Helical structures are the main structures that form the shell of a virus. Spherical Envelope in reality surrounds the main structures of some viruses giving it extra protection. Genomes are the Genetic Code that contains the information of how to create more of that kind of virus. Collecting viral component cards represents the way viruses are reproduced by the genetic code being read by the host cell, infected by the virus. "Virulence: An Infectious Card Game" is a simple card game that surprised me in the most positive way. 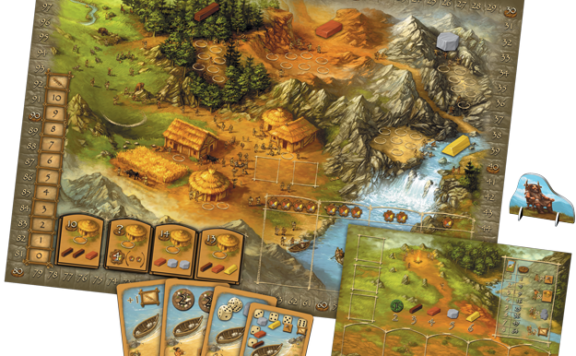 Though it can be taught within minutes, it presents solid gameplay with plenty of choices and a sense of control over the way the game progresses. Apart from choosing the Viral Component cards, you can also improve your hand of virus cards which will enable you to choose even better cards. The element of luck is present in the game through dice rolling but can be contained by choosing to pick Increased Virulence cards. The heart of the game lies on careful planning of how to play your virus cards in the most sufficient way. The artwork of the game stands out with its colorful design that stays close to the theme. This game presents an excellent way for kids to learn how a virus works while having a lot of fun. Its tight mechanisms make it a solid choice in the category of short-duration board games. 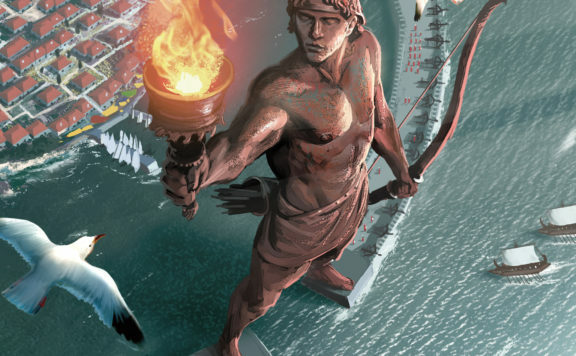 The publisher of the game, Genius Games, focuses on games related to science and also publishes science textbooks. You can find more of their science-based board games here. 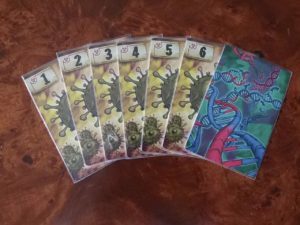 Virulence: An Infectious Card Game" is a simple card game that surprised me in the most positive way. Though it can be taught within minutes, it presents solid gameplay with plenty of choices and a sense of control over the way the game progresses. Apart from choosing the Viral Component cards, you can also improve your hand of virus cards which will enable you to choose even better cards. The element of luck is present in the game through dice rolling but can be contained by choosing to pick Increased Virulence cards. The heart of the game lies on careful planning of how to play your virus cards in the most sufficient way. The artwork of the game stands out with its colorful design that stays close to the theme. This game presents an excellent way for kids to learn how a virus works while having a lot of fun. Its tight mechanisms make it a solid choice in the category of short-duration board games. The publisher of the game, Genius Games, focuses on games related to science and also publishes science textbooks.